This is a green necklace, or rather a blue-green one. I decided to call it Mizu no Hana, or "Water Flower", flower from the water. 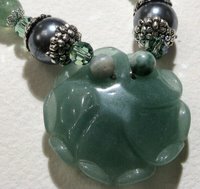 Another necklace of Japanese inspiration. 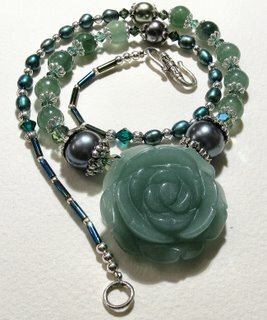 When working on it, I thought about lotus flowers, pearls and a peaceful, Zen-like, Japanese landscape. 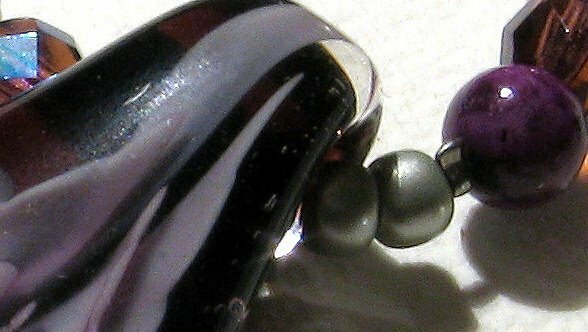 - Silver-plated round spacers and bead caps. On the left, a detail of the jade beads, some Swarovski bicones and small filigree silver-plated caps. 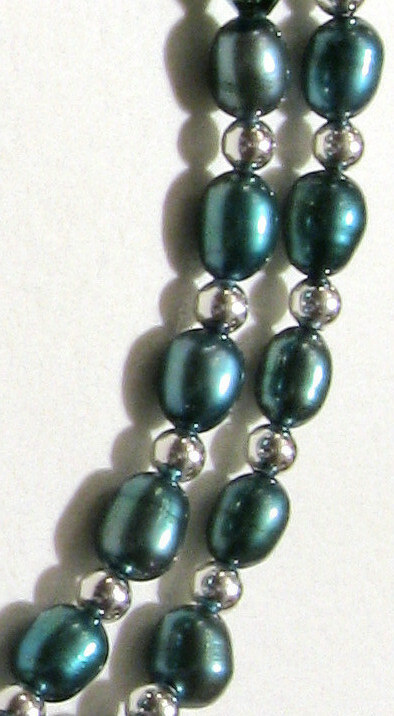 The other picture shows the lovely fresh water pearls and some of the small silver spacers. 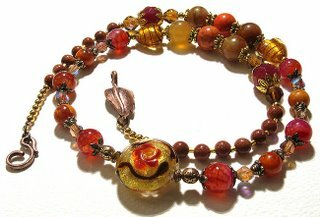 And a final view of the necklace -rolled-up, the way I like! I made another necklace tonight. I was dying to use some of my new dragon veins beads. Then I remembered that Mark once said I should make something really gothic, very, very dark. 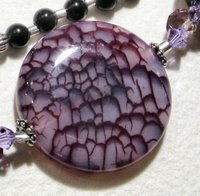 Dragon veins are ideal for that kind of thing due to their variety of colours and a very peculiar texture that really resembles a reptile's skin. Or indeed the veins of some magical beast. I decided to call it Strega (which means "Witch", in Italian). I also had in mind some books by Carlo Ginzburg, Italian historian, notably the brilliant "Ecstasies. Deciphering the Witches' Sabbath", which I read years ago and enjoyed a lot. I was thinking about revisiting it perhaps. All related to witches and gothic, magical stuff, so there you go. 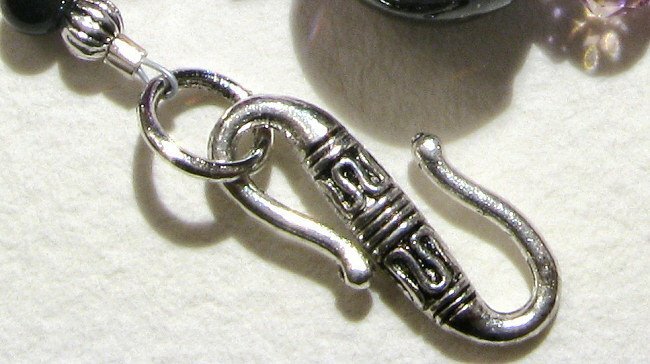 - Tibetan silver clasp (my favourite kind). 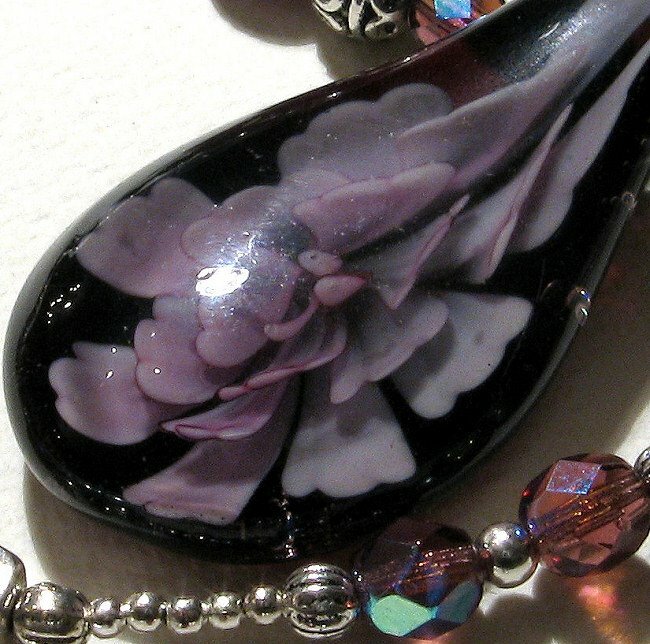 On the left, we can see the dragon veins focal bead. The "veins" are very strong, very marked. Above, a little detail of the obsidian beads and seilver crimps. 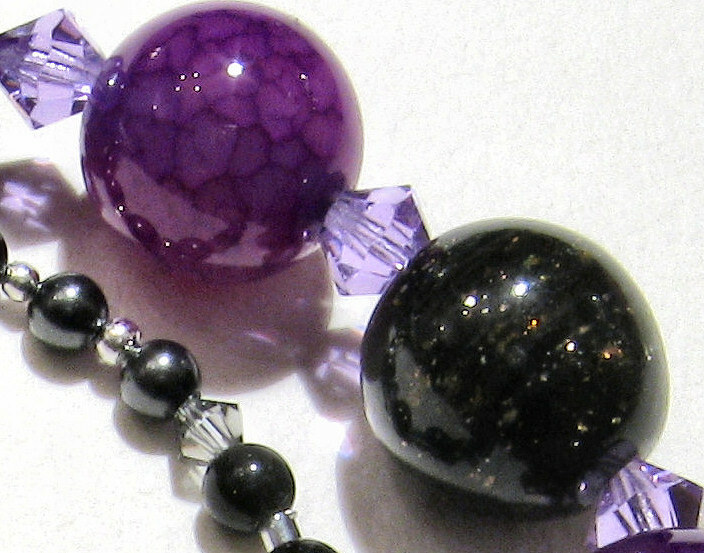 On the right, we have one of the dragon veins beads and one of the dichroic ones, as well as some Swarovski black pearls and amethyst bicones. 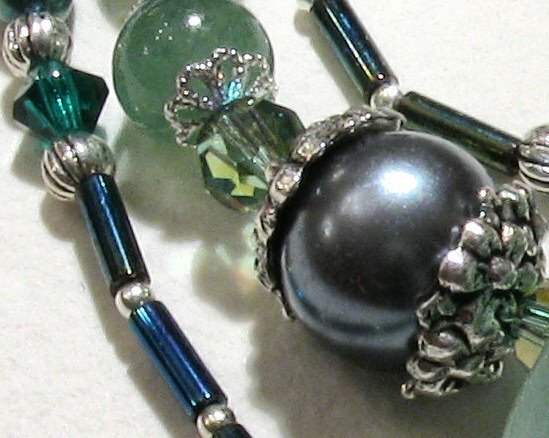 On the 1st picture a detail of the Swarovski bicones and pearls, and obsidian beads. 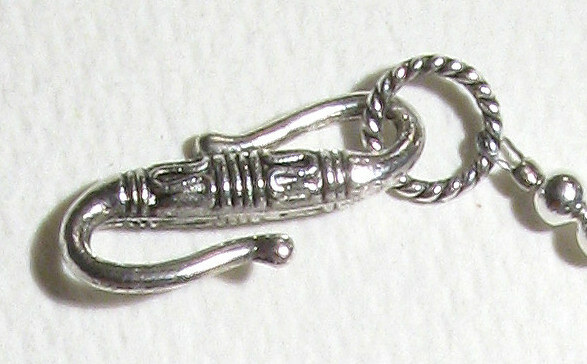 On the 2nd one, the clasp, a S-hook in Tibetan silver. They are very secure and look quite nice. As Hanami (viewing of the cherry blossoms) is for Spring, so is Koyo ("colourful leaves") for Autumn. Viewing of the Autumn colourful leaves, is what the name means. 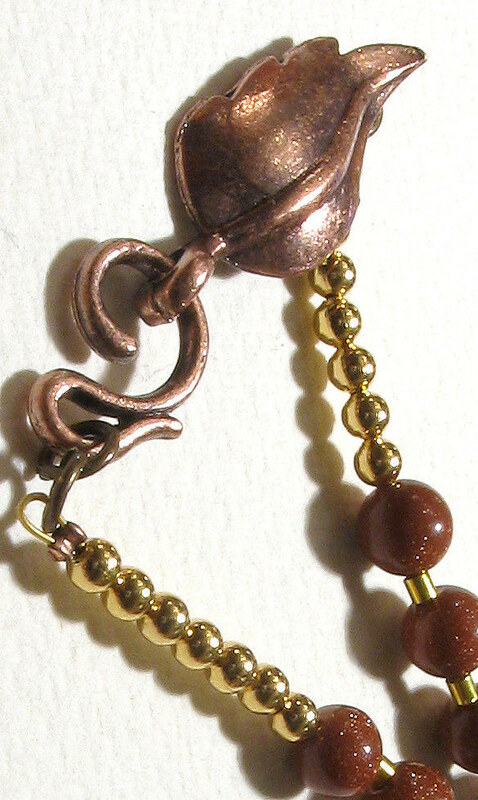 - One of my favourite clasps, a copper leaf. 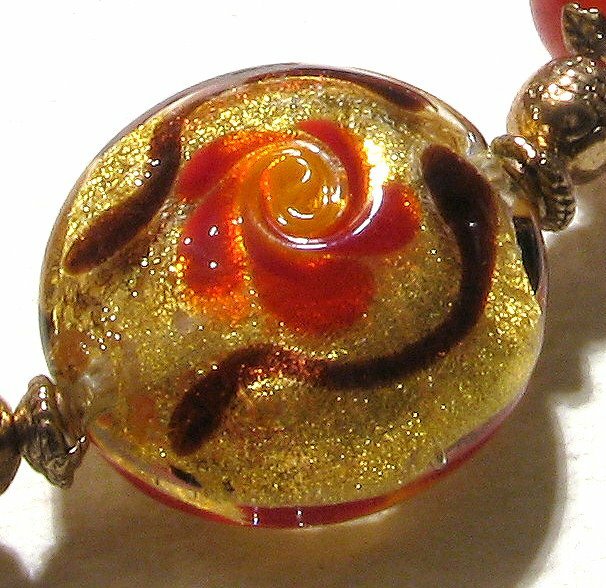 The 1st picture shows the Murano focal bead in detail, with gold foil and a red rose swirl. 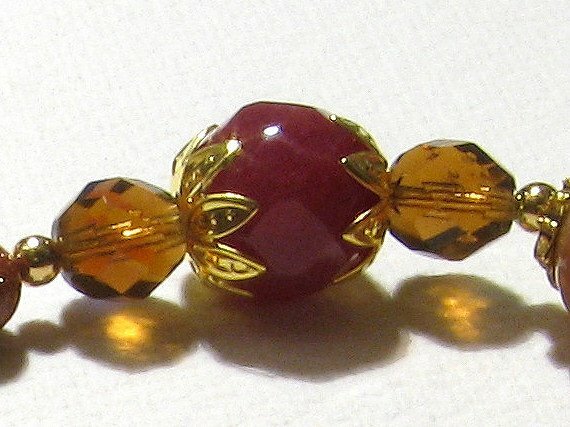 The 2nd one shows some of the gold-plated spacers, some Czech Fire faceted beads and one dark red ruby surrounded by two bead caps in the shape of a leaf (or flower). 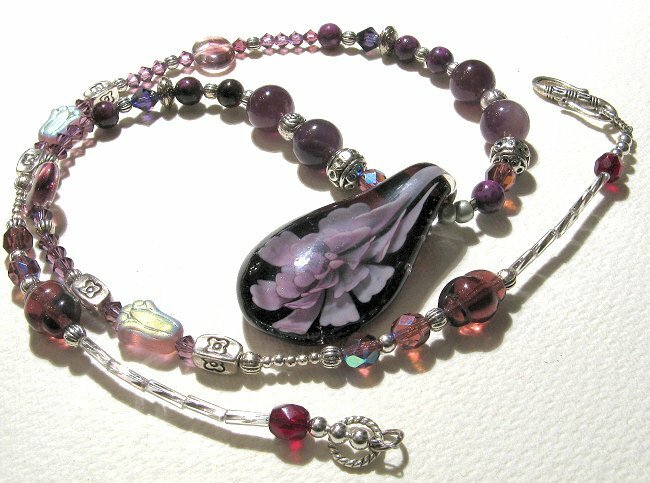 I tried to vary the bead caps for different stones in the necklace, also to represent the variety of trees and leafs you can find in a single forest. They also look a bit like fallen leaves, due to their antique gold, copper hues. 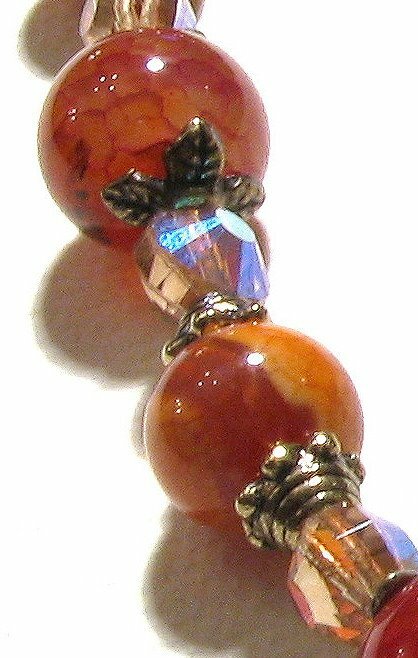 And, on the 3rd picture, you can see one of the red jade beads followed by a fire agate deep orange one. Other types of bead caps are also visible here. 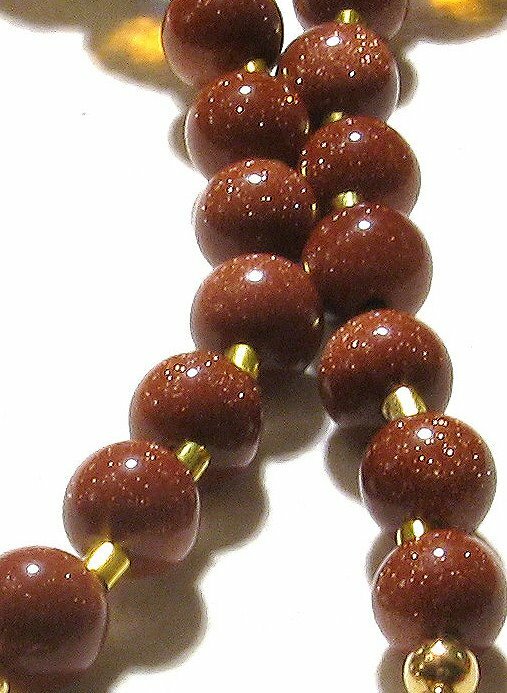 On the 1st picture, you have a detail of the nice goldstone beads. 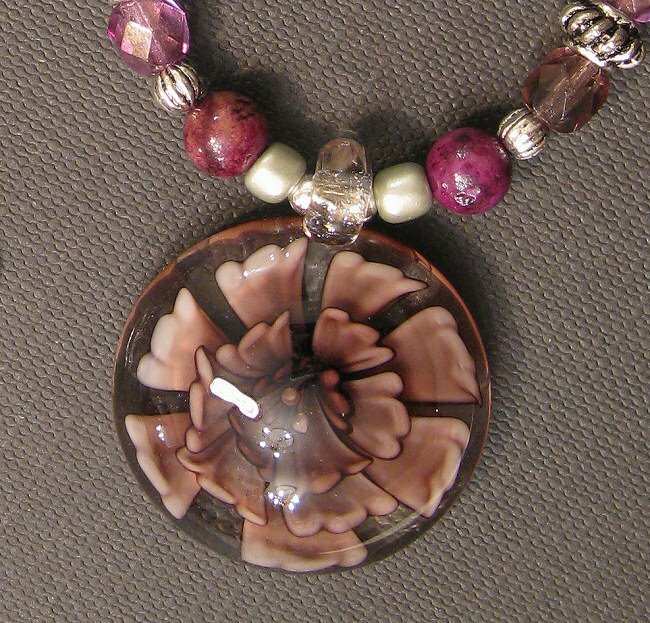 Their lovely red brick colour derives from the amounts of mica and hematite present in their composition. 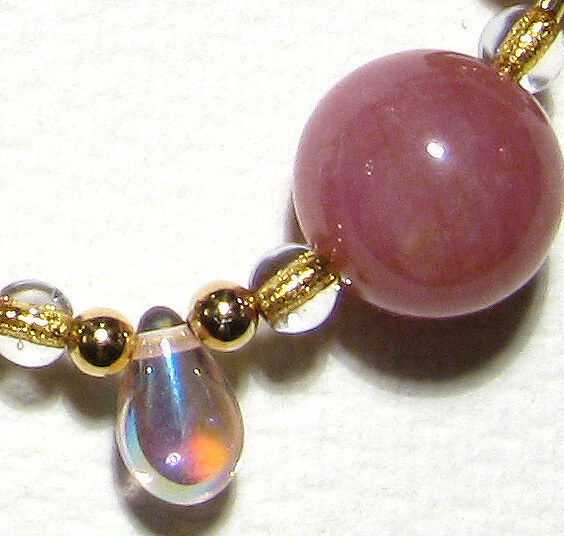 They are insterspaced with tiny gold crimps, as I said before, and which are visible here. 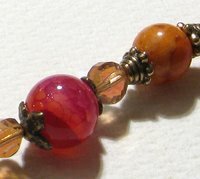 The 2nd picture shows one of the Czech AB beads, one red jade bead at the top, and further down, another fire agate bead. 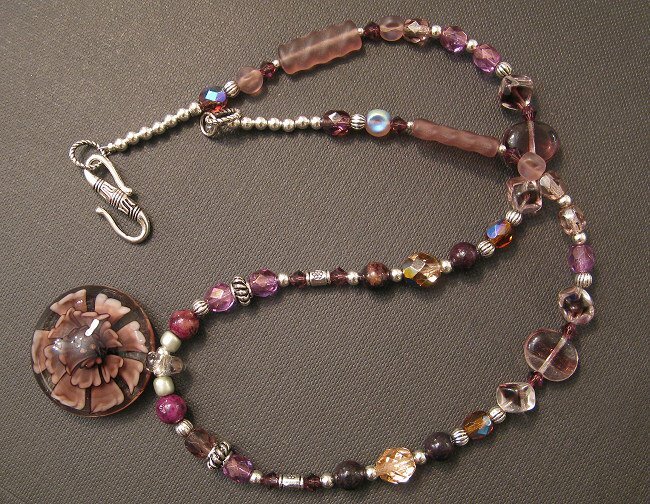 The 3rd one shows the copper leaf clasp. 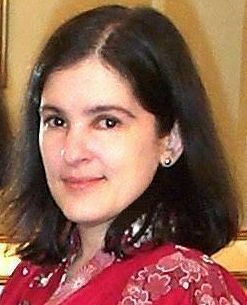 a dress of silk and gauze. - Czech glass beads in various shapes and cuts, including 4 really cute square ones. These pics show details of the lovely square Czech beads, Swarovski crystals and some of the Chrysocolla beads. 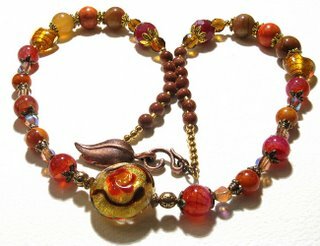 You can also see some of the Tibetan silver lantern-shaped spacers, the tiny silver-plated balls and also one of the Czech fire faceted beads I used. 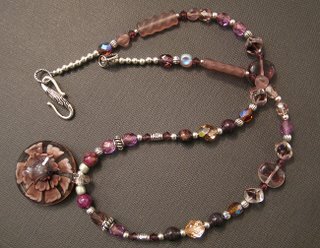 On the above, you can see again some of the Czech fire beads, spacers and chrysocolla beads, and also the S-hook tibetan silver clasp, which I quite like. 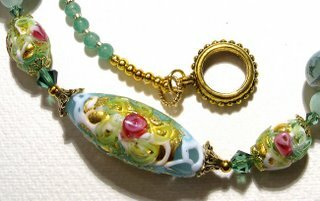 A detail of the Chinese lampwork pendant, paperweight style, some more of the chrysocolla beads and small silver Czech seeds. I use these to make a smoother curve where the pendant is, otherwise it might look a bit too "angular" and "broken". 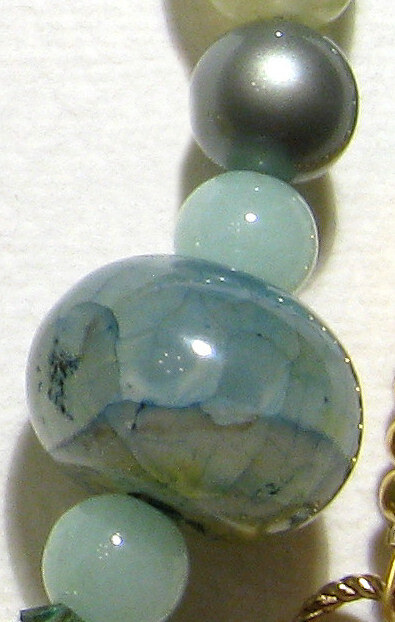 As you can see, the chrysocolla vary a lot in shade: these two - that I put closer to the focal point, ie, pendant - are pinkier than the others. - Swarovski bicones as accent beads. 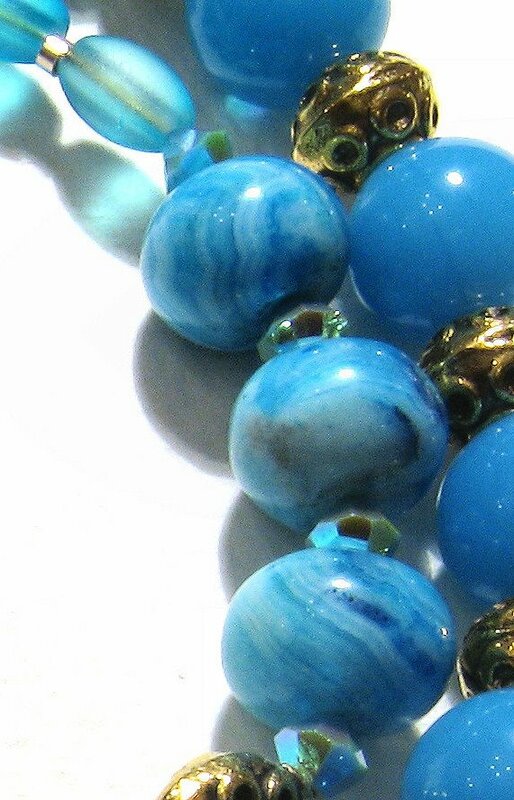 As for the chrysocolla beads, I am not sure if they are 100% natural or man-treated, ie, dyed. 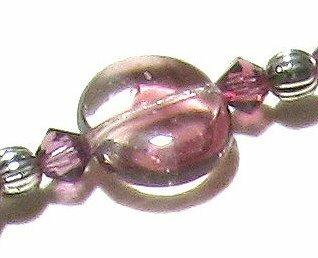 They have for sure a nice purple colour (not entirely discernible in the shots, I'm afraid), but the texture is kind of rough. 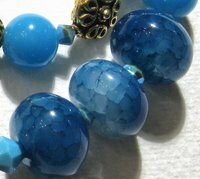 I have some green and blue ones in my stock here and, although they look beautiful, I don't quite like their texture, very heavy and harsh. 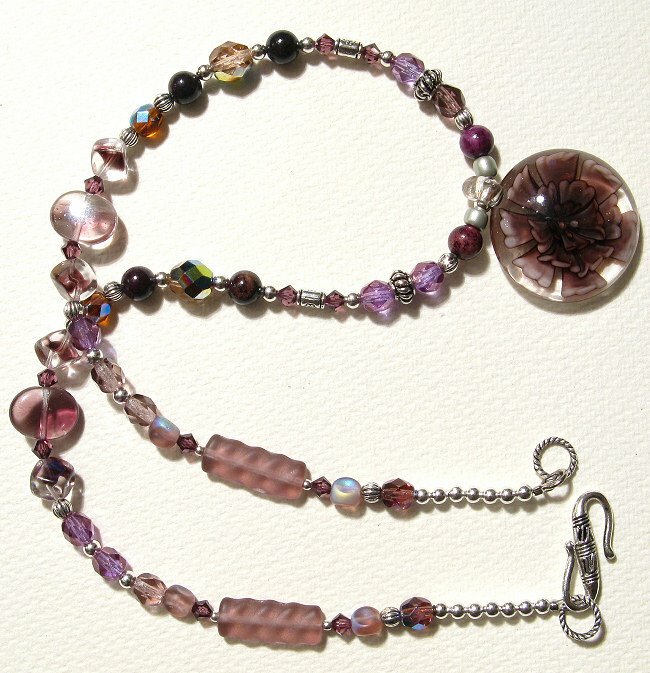 At the left you can see the lampwork pendant in detail, along with some tiny silver balls, lantern-shaped Tibetan spacer and two Czech fire faceted beads. 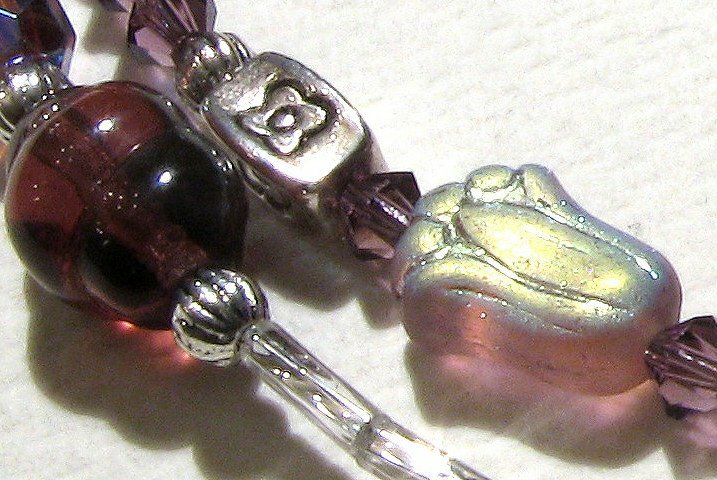 In the right, a close-up of the seed beads used under the pendant. 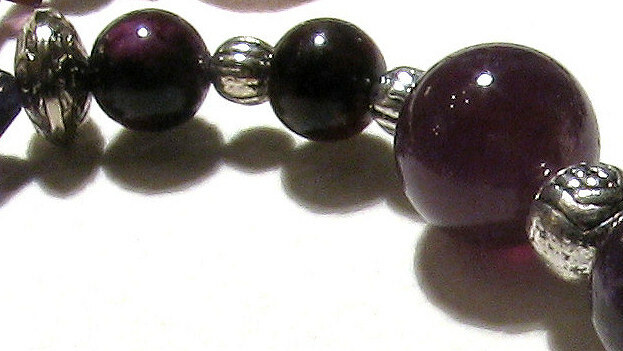 You can also see one of the chrysocolla purple beads. 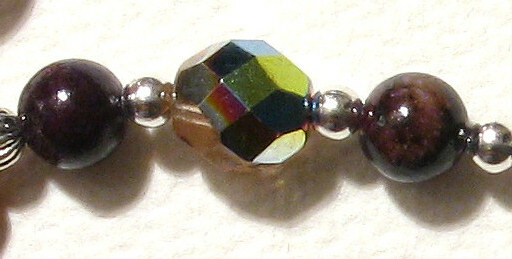 Details of the Czech beads, Swarovski crystals and various Tibetan silver spacers. 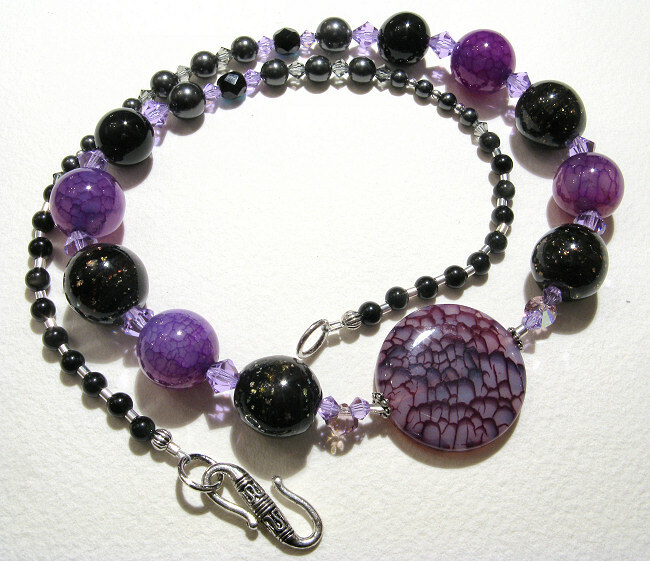 The big amethyst beads, silver spacers and two of the chrysocolla beads. 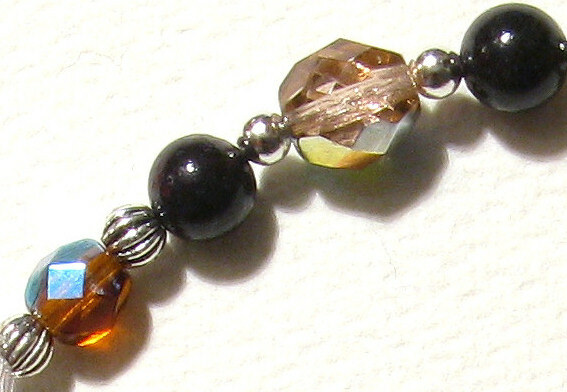 Also, the clasp, one of the accent Czech fire beads and silver-lined bugles. Amé means "rain" in Japanese. 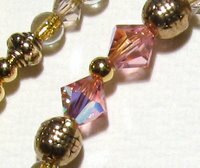 Although this necklace has no Japanese beads whatsoever, the beads I used (Czech fioratto beads, Swarovski pearls and bicones, Czech gold-foiled seed beads) all have a wet, watery feel to them. It is like a string made of water drops. Mark thought so, and I agree. 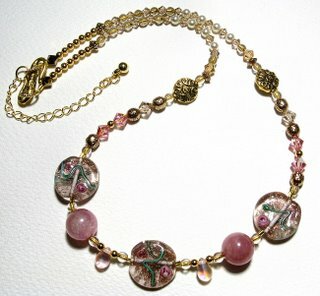 After thinking about it as a rose water necklace, I could not but hear Mark's arguments about it: "it's rain, Andrea, rain". It is indeed a "wet" piece. Amé, for my love of Japanese things and language. - 2 pink jade round beads. In the picture at the left-hand side, you can see one of the pink jade beads used, the tiny gold-foiled seed beads and one of the Rosaline drops. The other picture shows one of the main Czech fioratto beads, with the gold foil giving it a "wet" appearance, along with some of the bicones and, again, the seed beads. 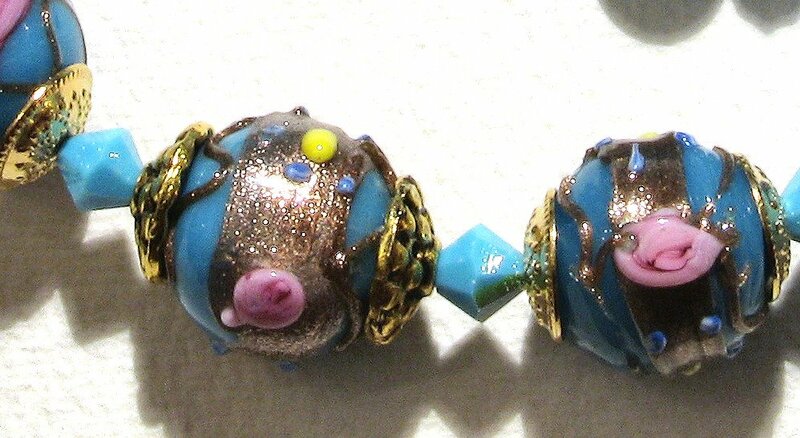 Detail of some of the Rose AB bicones, and antique gold spacers. Also, the clasp used. Since Amé is much shorter than usual, I have added a gold-plated extension chain so it can be worn longer if desired. Still on the (recunrrent) theme of the Amalfi coast, and inspired by the lovely Murano beads, I made another necklace today: the Ravello. Ravello was one of my favourite spot during our trip to Amalfi: a beautiful town up in the mountains, with wonderful gardens, music in the streets and the best of two wolrds - sea and mountains. 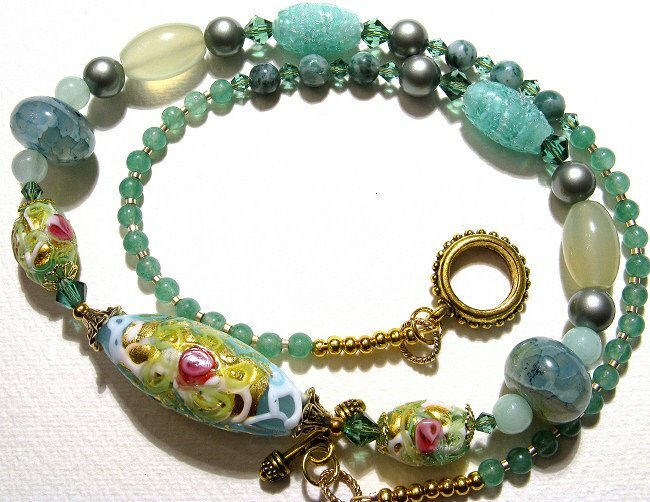 Its gardens smell beautiful too, and that's probably why I have selected some beads in shades of green, aqua and teal, just to capture a bit of the sea, trees and sky hues. 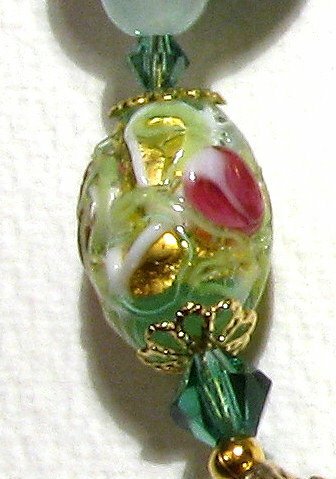 - Antique gold tulip and daisy bead caps. 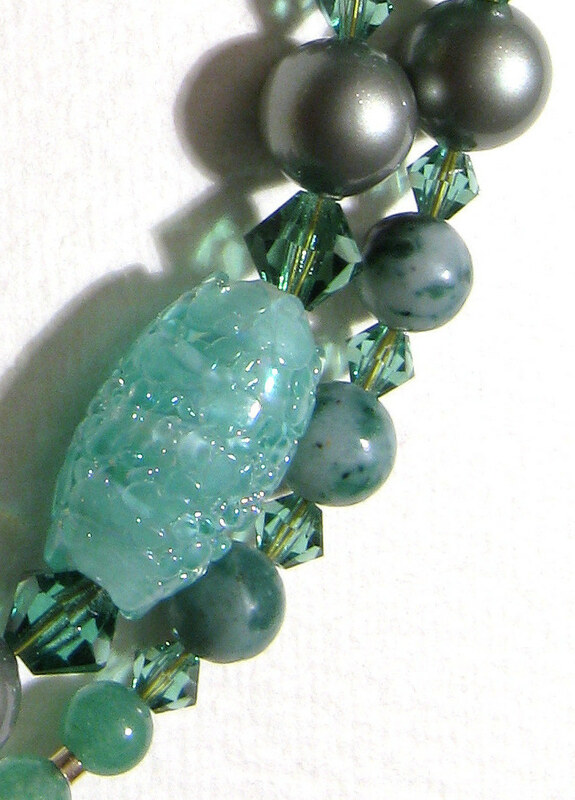 Three pretty Murano fioratto beads in shades of green/aqua. You can also see the antique gold tulips and clasp, the Swarovski crystals and the aventurine beads. In the 1st picture, a detail of the Czech "sugar" beads, the powder green Swarovski pearls, the erinite Swarovski bicones and some small milky green jade beads. 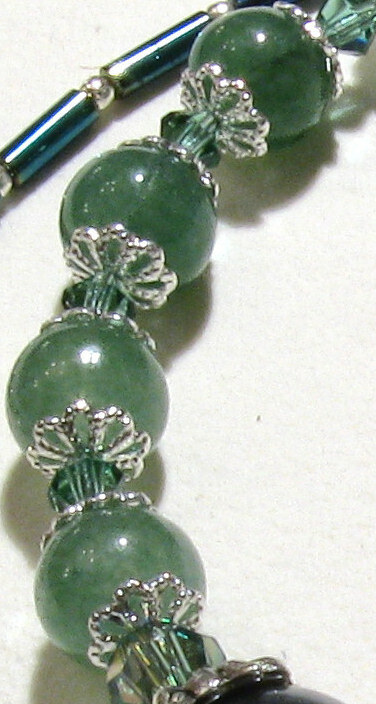 Iin the 2nd one, a close-up of the dragon vein rondelles, milky green opaque jade beads and powder green Swarovski pearl. And, on the 3rd picture, one of the small fioratto aqua beads with a daisy filigree gold cap and Swarovski bicone. 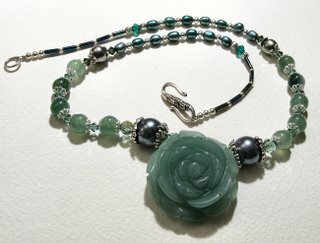 This is the necklace I have finished today. 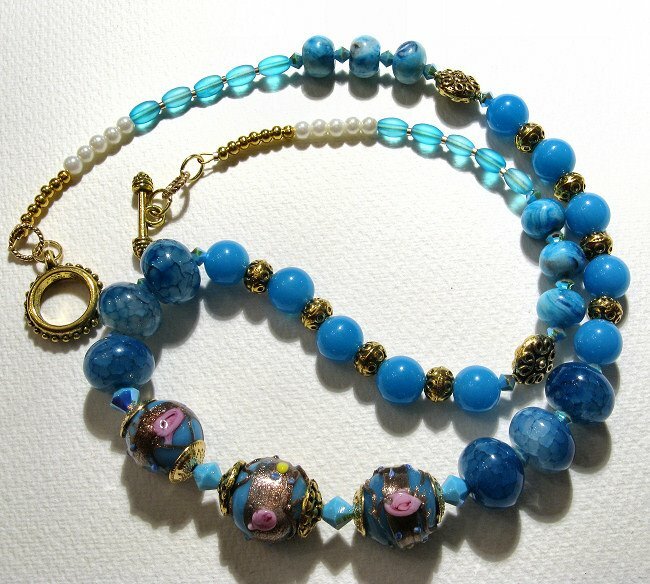 Decided to call it Azzurra (Blue) due to the use of quite a number of blue beads - 3 focal Murano wedding cakes, blue jade, crazy lace agate, dragon veins (another kind of agate), turquoise Swarovski crystals and so on. It is a blue, South Italian theme, the Grotta Azzurra in Capri, those amazing seas once again. It seems I am quite obsessed with them, no? - Antique gold spacers and clasp. Impossible not to fall in love with dragon veins. Its texture is so amazing and colours so diverse. Here you can see them in the 1st and 3rd pictures. 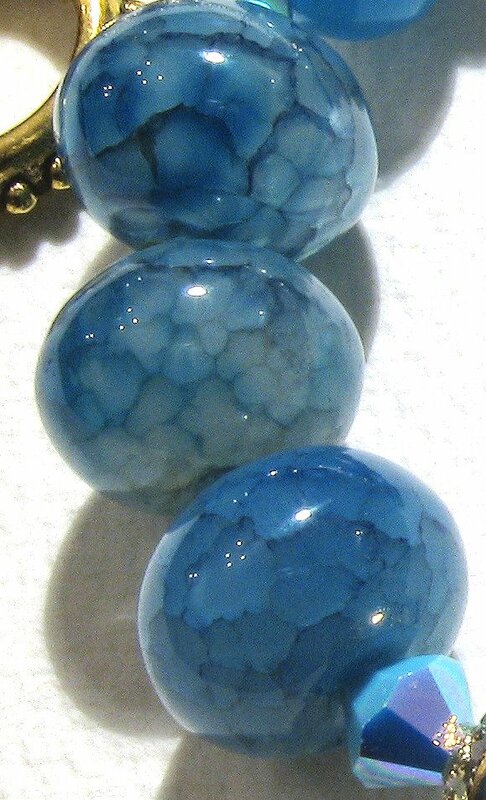 The crazy lace agate appears on the 2nd picture, along with some lovely blue jade beads. The blue jade is, among the 3 stones, the one with more uniform texture and colour. 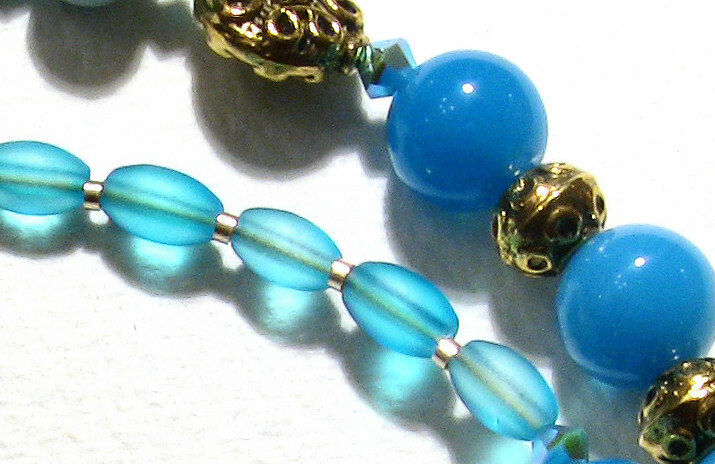 Detail of the Czech fluted beads, gold crimps in-between, spacers, blue jade beads and one small turquoise bicone. 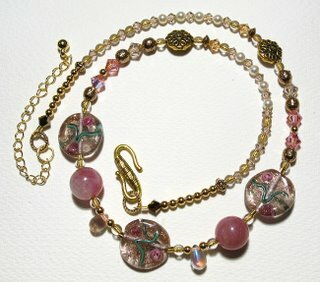 I have used stainless steel gold wire, that can be seen through the Czech beads. 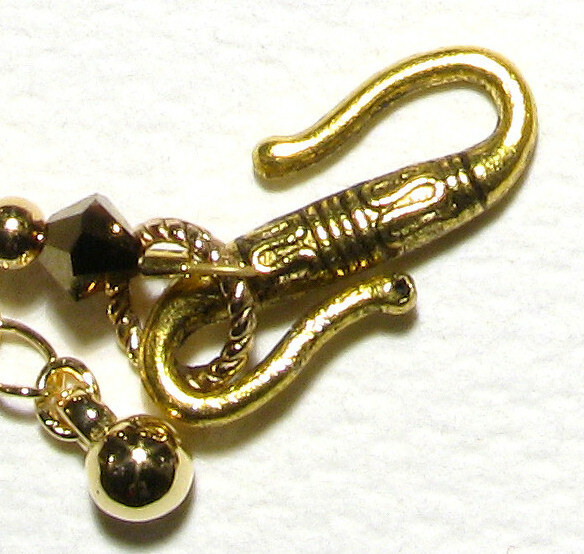 To finalise for today, a detail of the antique gold clasp. 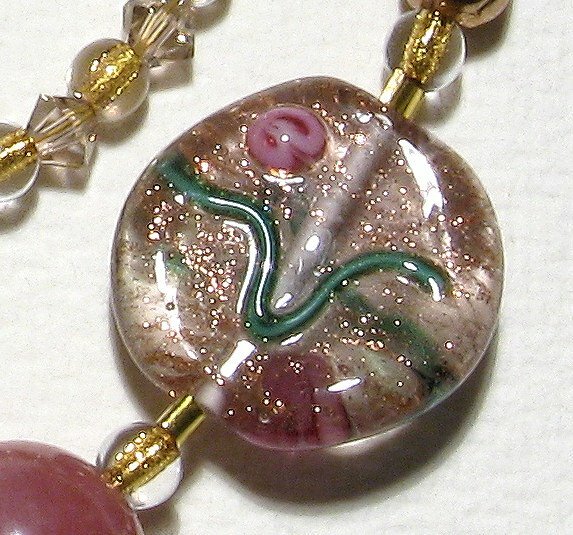 You can also see the loop I made with the wire to attach the clasp. It is the 1st time I use this method: leaving the crimp and wire apparent instead of using a tip to cover it. I quite like the result: it looks lighter and somehow cleaner too - as far as the colour of the wire does not clash with the spacers and clasp, that is.